Preliminary results of the investigation into a fatal BN-2A Islander accident in Antigua led the U.K. AAIB to issue a safety recommendation to EASA regarding fuel suction filters. 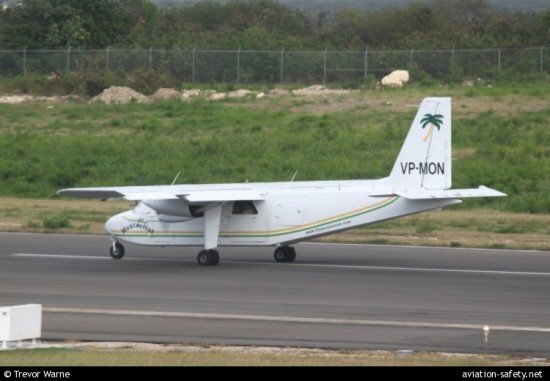 On October 7, 2012, a Britten-Norman BN-2A-26 Islander passenger plane crashed during takeoff from Antigua, killing the pilot and two of the three passengers. FlyMontserrat flight 107 was a scheduled service from Antigua to Montserrat. Weather conditions at the time of departure were good, although convective clouds and heavy rain showers had passed over the airport while the aircraft was parked before flight. Approximately 40 mm of rain fell at the airport during this period. There was no evidence that a water drain check was carried out on the aircraft following the rainfall. Shortly after takeoff, the aircraft yawed and rolled to the right, descending rapidly and apparently out of control. It impacted the ground within the airport perimeter, right wingtip first and steeply banked to the right at low forward speed. Examination of the wreckage showed the right hand engine was not producing power at the time of impact. Investigation of the fuel system showed contamination with significant quantities of water. The right-hand fuel filler cap was of a design that was incompatible with the filler neck. Tests showed that the cap, installed in the neck, could allow water to pass into the fuel tank, for example if the aircraft were parked during periods of rain. It is recommended that the European Aviation Safety Agency takes action to require that Britten-Norman Islander aircraft are equipped with fuel suction filter assemblies which minimise the likelihood of any water present in the fuel tank sumps being fed to the engines. A modification suction filter is in use since 1968 but had not been installed in all BN-2A Islander models.